Irrigation Traveller Drag Hose (sludge injection) is a specialty, high tensile strength layflat designed as an umbilical feeder line on plows, tow tractors, or agricultural injector machines for transferring sludge, slurries, certain fertilizers, and liquid manure. The land application of these liquid sludges is very demanding and requires a hose that has a very high tensile strength and available in long lengths (never tow one part of the hose on top of itself or another). We offer drag hose in several different constructions or brands based on durability and user preference. NL2440 is made of standard PVC materials. Typical Fittings: Application dependent, typically fire expansion fittings (NPT thread, NH/NST, or NPSH) or agricultural ring-style/Anfor/Bauer couplings. 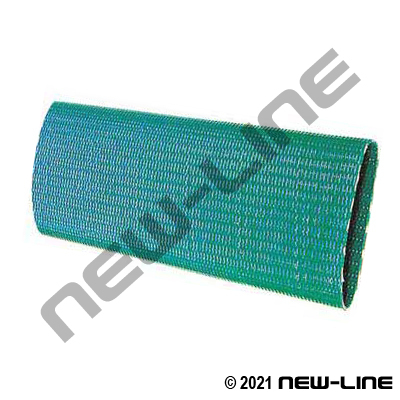 Construction: Green ribbed PVC layflat with 3-plies of yarn. Both tube and cover are extruded simultaneously to obtain maximum bonding.